Illustration by Velizar Simeonovski, The Field Museum, for UT Austin Jackson School of Geosciences. Introducing Caihong juji, a tiny, Jurassic-era dinosaur that lived 161 million years ago in what is now China. The feathered theropod featured an iridescent, rainbow colored ring of feathers around its neck, which scientists believe it used to attract mates. A nearly complete skeleton of Caihong juji—a name that means “rainbow with the big crest” in Mandarin—was discovered by a farmer in China’s Hebei Province in 2014. Researchers from the University of Texas at Austin and Shenyang Normal University have been taking a close look at it, releasing their findings today in Nature Communications. 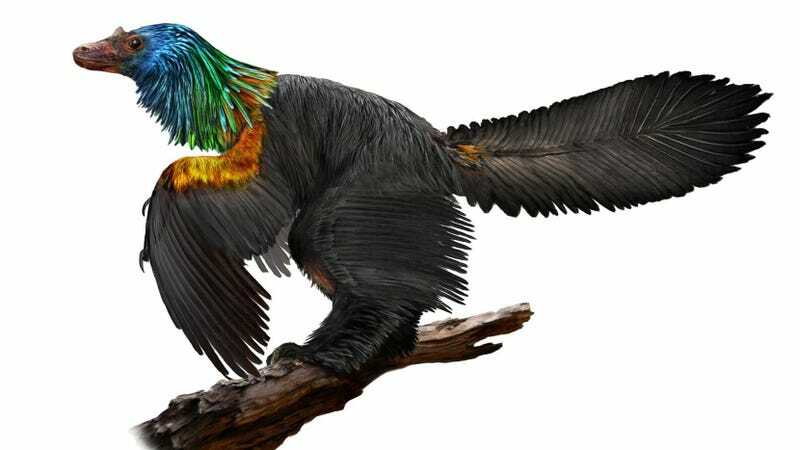 Paleontologist Dongyu Hu, the lead author of the new study, says the newly discovered dinosaur contained a curious mix of ancient and modern features, including iridescent plumage seen in some living birds. This distinctly bird-like creature belonged to a group of dinosaurs known as the Yaniliao theropods, a suborder known for their hollow bones and three-toed limbs. Using a focused ion beam-scanning electron microscope, the researchers analyzed the impressions on the fossil left by C. juji’s feathers. The plumage on its neck contain what appears to be traces of melanosomes—wide, pigment-containing packets that give feathers their color. A comparative analysis of these melanosomes resulted in a close match with the iridescent, rainbow-patterned feathers found in hummingbirds. The researchers speculate that this was an ornamental display used to attract mates. Looking ahead, the team is hoping to learn more about this dinosaur’s habitat and lifestyle to understand how it evolved such a distinctive, colorful look.